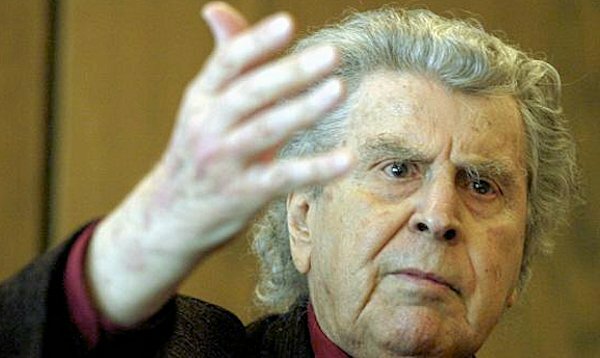 One of Greece’s most renowned artists, the songwriter Mikis Theodorakis, has issued a public call to combat Holocaust denial by senior members of the extreme-right Golden Dawn party. In an open letter published under the headline ‘We must react now while there is still time’, the 87-year-old called a “disgrace” the fact that a member of Parliament could even think of questioning from the Parliament’s podium the existence of the Nazi Holocaust against the Jews, the greatest crime ever to be committed in the history of mankind” and said it “tarnishes the image of our country”. Theodorakis wrote: “The genocide against the Jews constitutes without any doubt a tragedy of unheard of and unimaginable evil; it makes one feel ashamed of being human, considering that the murderers of Auschwitz were humans like us, transformed into sub-human monsters. For how could it have been possible to arrest children, women, old women, old men, innocent people, whose only crime was that they belonged to another race and religion, a race that gave birth to Einstein, Freud, Marx, Mahler and countless others benefactors of humanity, load them into wagons like animals, force them to travel for endless days and nights and at the end of the journey, subject those who remained alive to indescribable methods of torture and death. An eternal nightmare, the worst experienced to this day by mankind, that makes you sick just thinking about it, while the victims, especially the innocent children, turn into angels inside you and you feel the need to kneel before them, offer eternal apologies and tell them this: ‘I am ashamed that I too was born human.’"
In addition, the composer sent a letter to the president of the Central Board of Jewish Communities in Greece, David Saltiel, in which he expressed his outrage for what he called “unacceptable statements” by Golden Dawn lawmakers denying the Holocaust.